Washington (CNN) – Last month, it was excerpts honoring her mother in Vogue. Last week, it was the dates and locations of her book tour events. Tuesday, it was the release of her careful four-page author's note. And on Wednesday, publishers for Hillary Clinton's upcoming memoir "Hard Choices" rolled out a four-minute video of the former secretary of state discussing the upcoming book. Hillary Clinton – and her publishers – want you to know she is releasing a book. And in doing so they are pulling extensively from the last four months of her time on the speaking circuit by touching upon familiar themes in promotional materials and releases. In the video released on Wednesday exclusively to Facebook, Clinton says readers should expect a behind the scenes look at her relationship with President Barack Obama and his White House, as well as her argument that the United States is not in decline. "At the time I became Secretary there was a fairly strong current of thinking that United States was in decline," Clinton said. "Now, I have lived long enough to know that that periodically surfaces - and academics and commentators and others start talking about the United States declining. I didn't believe it then and I don't believe it now." Clinton has made a similar argument before in her numerous speeches to trade associations, corporate groups and college students across the country. Four months ago, at a speech in New Orleans, Clinton said that her faith in the United States "is deeper than ever" and the country is still the "indispensable nation." In February, at a speech to a healthcare group, she said the same thing: "My faith in this country is deeper than ever." If that sounds familiar, that's because it is. In Tuesday's excerpt release, Clinton argued the same thing – that her experience in American politics has convinced her that "America remains the 'indispensable nation.'" That is not where the similarities end. Clinton has pointed out at numerous events – including in New Orleans – that America's leadership in the world is not a birthright. She made the same case in both Wednesday's video and Tuesday's excerpts. "I am just as convinced, however, that our leadership is not a birthright. It must be earned by every generation," she wrote in the excerpts. Clinton is admittedly thinking about running for president and while he has not announced her plans, she is widely considered the frontrunner for the Democratic nomination. Her recent remarks and the rollout of her memoir have become a sort of stump speech she gives audiences around the country and many of the same ideas are in her the preview she is giving of her book. Clinton has said the book begins with her accepting President Barack Obama's offer to become secretary of state and covers a range of topics, including Iran, Syria and Libya. She has joked that the memoir will be "just another light summer read" and will cover topics from "Crimea to climate change." 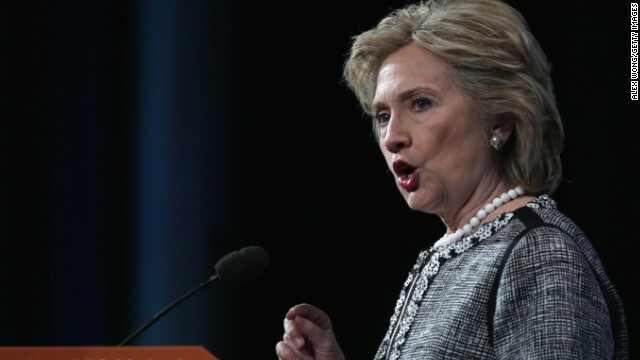 At recent events, Clinton has stepped her populist rhetoric. She knocked former President George W. Bush as someone whose "only policy prescription is to cut taxes for the wealthy," at an event earlier this month. She has also repeatedly heralded the importance of a strong middle class and derided income inequality, something her party's left focuses on regularly. "We know that America is strongest when prosperity and common purpose are broadly shared," Clinton said at the New America Foundation in May. "When all our people believe they have the opportunity and in fact, do, to participate fully in our economy and our democracy." Clinton made a similar argument in Wednesday's video. "I think that people will see that we are strong and well equipped to restore prosperity here at home, to deal with the cancer of inequality, to give people in our country the ladders of opportunity that have always been a hallmark of the United States and the American dream," she said. Even the jokes are the same. Clinton has made it a habit to joke about the process she undertook in naming her memoir. She often mentions a Washington Post submission contest in which one person suggested naming the book "The Scrunchie Chronicles: 112 Countries and It's Still All About My Hair." On Tuesday, the joke made it into the book's Author's Note: "My favorite was "The Scrunchie Chronicles: 112 Countries and It's Still All about My Hair," Clinton wrote. What??? No entire chapter on how she handled Benghazi? Where are the ten chapters detailing all of her accomplishments as Secretary of State? I guess that was covered on the inside sleeve of the book cover. Yes, Hillary Clinton, just another light summer read.... certainly nothing of substance or accomplishment. I can hardly wait for the chapter dishing all the dirt about her great relationship with Obama. oooohhhhhh, I think I'm swooning! She should stick a cigar in that mouth! I am looking forward to reading it when it comes out. She is an interesting and thoughtful person and hopefully this will give insight into her thinking. So, maybe old Gunderson write book. Should be a dandy. Probably have front page and back page. Already have bids for movie Rights. OK. Seriously it will be another book for the History Buffs. No, i won't buy it. I've been down that road before, and back, many times. Didn't Hillary write another book? Of course she has to argue the USA is not in decline. She has been a part of the Obama administration for four years as the country has become a laughing stock around the globe, all on her watch. How's that Russian Reset thing working out for us and the Ukrainians Hillary? I can hardly wait to read that chapter in her book. Or did it get the axe in favor of the chapter on the coming Ice Age, I mean global warming, oops I mean Climate Change, or is it Cow Fart Doomsday? -right now these republicans are pretty much scared of her. Because she is only viable, indispensable candidate. Unfortunately none of the GOP fit to lead. -right now these republicans are pretty much scared of her. Because she is only viable, indispensable candidate. yup, heard the same thing in 2008... and then the democrat voters spit all over her and voted for the first black president instead. so if she wasn't good enough in 2008, why is she good enough now? her last 4 years have been a disaster. just ask the families of the 4 americans she got killed in benghazi. and then she went on to lie to them face to face as well. i guess all that matters to her is her political skin and if it takes 4 people dying and a bunch of lies to cover it up, well then so be it. What possibly could be in that book really ? What deference does it make anyway . Its just a dust collecter with lots of fiction . She probably didnt write it anyway ta ta . Nothing but nasty comments being posted. Yep this is the liberal Clinton news network. "Hillary Clinton – and her publishers – want you to know she is releasing a book. And in doing so they are pulling extensively from the last four months of her time on the speaking circuit by touching upon familiar themes in promotional materials and releases." In other words, they're following the EXACT same playbook everyone follows (regardless of party) when releasing and promoting a book but CNN has chosen Hillary Clinton to single out and treat differently over it, harping for some unknown reason on her and her publisher sticking to a particular script. What a farce your reporting has become CNN. Maybe you could tell me when the New Sarah Palin Book , " If I Were Queen " , will be released ? Also , explain to me the deference between the Conservative Tea Party and Racism ? --people are not caring Benghazi. It ten thousand miles away. Demography is changing to first black president to woman president. Who knows next sone Chinese or Indian American vying. Be prepared. GOP is out of touch with reality. It is the main problem. –people are not caring Benghazi. It ten thousand miles away. Demography is changing to first black president to woman president. Who knows next sone Chinese or Indian American vying. Be prepared. GOP is out of touch with reality. It is the main problem. @Donna – So let me get this straight. If Hillary would have said the Benghazi attacks were caused by Muslim militants that were mad because so many Muslim were killed during the 2 "unfunded/off-the-books" Bush wars instead of Muslim militants that were mad because of a video, then everything would be fine? Now I understand. No, because that would have been just as big a lie as her video lie was. If she had told the truth she would have said the consulate was attacked by a well organized group of AQ affiliated terrorists on the anniversary of 9/11, after they had threaten to attack it, attacked it previously, and yet no additional security was provided. But we all know that telling that truth would have destroyed Obama's campaign speeches about AQ be decimated and on the run and shown her to be an incompetent out of touch leader of the State Dept. So her lies about video tape were concocted and the video maker was rounded up and jailed. And this is the liar you would elect as President??? Of course it doesn't matter what she says or doesn't say. The conservative conspiracy machine runs best on canned phrases and as little facts as possible. We've been through hearings and analysis and of course this pales in comparison to the bloodshed Bush is responsible for, but conservatives have lit the torches and want a liberal sacrifice to make them forget their failed past rhetoric. "Hard Choices" I bet, do I stay with a guy who cheated and disgraced me in front of the whole world or do I play good loyal wife role? --any lie is a white-lie except WMD. Just gotta love these clowns that think the Presidency is a reality TV event based on race and/or gender. Qualifications? Experience?? Proven leadership skills??? Viable solutions to problems???? Ability to get things done????? All optional to them. Which is how we ended up with the 8 years Obama nightmare.